I started breeding a few litters of these so called "designer dogs". I had no intentions of doing this but a big loving Standard Poodle fell into my lap one day and I instantly fell in love with him. as many people who love dogs, have allergy problems. but with a lot less shedding and allergens. The Standard Poodle is very intelligent and calm. In fact, they are more intelligent than the Golden as I have discovered. A lot of breeders look down on these or any cross-breeds. I have always enjoyed all dogs and always will. This is the main reason why I enjoy the boarding part of my business so much. I like interacting with all the different breeds and just plain old mutts. There is so much you can learn from them. to do some relocation to new homes. I get great satisfaction in doing my small part. It's giving back all the love that I get from the canine world. but it irks me when someone thumbs their nose at a "mutt". Some mutts make the most loving pets ever. I also think it is very wrong to center out a specific breed and label them "dangerous". These breeds need our understanding and respect not our condemnation. THEY ALSO NEED RESPONSIBLE OWNERS!!! and does genetic clearances on their adults so that you can get the best puppy possible. Please stay away from back yard breeders and pet stores. You just never know what you are getting from these sources and it is estimated that 95% of puppies that come from pet stores originally came from puppy mills. My Standard Poodle is originally from Texas and is AKC and CKC registered. He is cream in color and has been cleared for hip dysplasia and Von Willebrand's Disease. After doing a lot of research into this breed I decided to try a litter with one of my English Golden's. I was worried about their temperament and certainly did not want to raise any hyperactive puppies. When I heard the word "poodle" I immediately got the image of a hyper, yappy and excitable animal who was not good with children. I just described a Miniature Poodle but the Standard Poodle is totally different. So I was completely blown away by the first litter. They were just as laid-back as my Golden puppies! I have had a number of litters since and have gotten great positive feed back from the families that have purchased them. They are smart, fun-loving and very laid back. 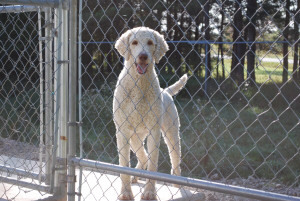 The Standard Poodle is also a sports dog who loves the water, so this also fits in well with the Golden Retriever. before and after visit to the "barber shop". You'd never know it was the same dog. and loves everyone he meets, man or beast. 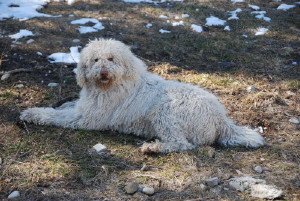 I acquired two female Standard Poodles as well and they have have had a few litters with Buzz. I kept a few males back for breeding as well. You can see them on my tab labelled "Standard Poodles".